Alternative history is all about the what if’s. What if events were to have happened even slightly different? How would it have changed the course of the rest of history? The 22nd of November 2013 marks the 50th anniversary of the assassination of the 35th President of the United States – John F. Kennedy. That fateful day in Dallas Texas could have ended very differently. It’s possible JFK could have survived. 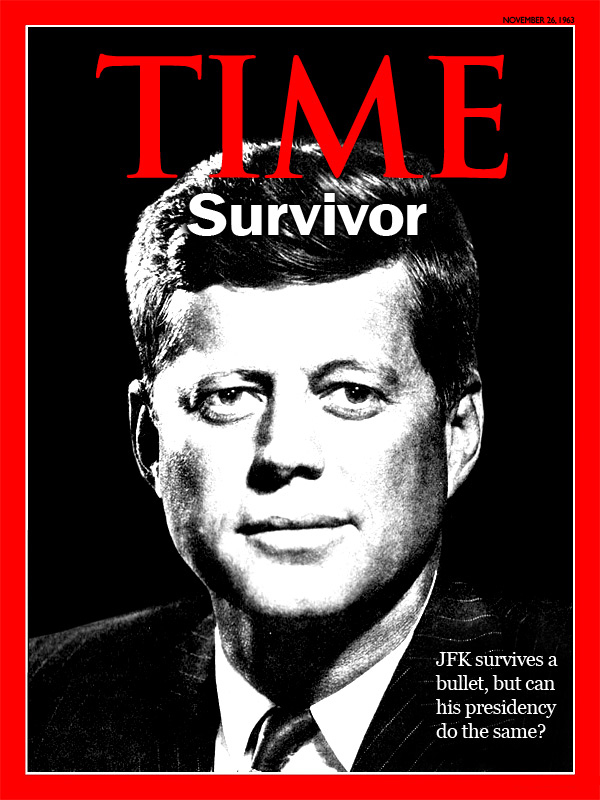 I decided to mock a TIME Magazine Cover for the alternative history scenario. Click on the cover to view the full size image. There is much debate on what actually occurred that day, spawning numerous conspiracy theories. Terms like ‘lone gunman’, ‘magic bullet’ and ‘grassy knoll’ became part of our lexicon. Most recently, an interesting theory has been put forth by Australian detective Colin McLaren (Aussie’s represent!). He states that secret service agent George Hickey accidentally fired the kill shot while waving around a rifle from the follow up car. The documentary ‘JFK: The Smoking Gun’ is well worth a look if you can track it down online. The fact remains, 3 shots were fired. One hit the ground, one struck Kennedy in the throat before hitting the governor of Texas who was sitting in front of him in the vehicle. The third and final shot hit Kennedy in the head, taking most of the right hand side of his head with it. A fatal catastrophic injury. By all accounts if it wasn’t for the headshot it’s possible he would have survived the neck wound and recovered to resume his presidency. There are hundreds of conspiracy theories on this event but the truth is JFK was not as innocent as his ‘all forgiven in death’ image has portrayed him. It cut short a presidency that was marred by near disasters – the Bag of Pigs invasion and the Cuban Missile Crisis all loomed as precursors to armageddon. If he had served a second term would he have been spared the unpopularity that Lyndon B. Johnson faced over the Vietnam War? To his credit, JFK had a history of deferring his military advisors over plans of war. Johnson upped the ante as soon as he entered office. Would nuclear war have broken out with Russia causing mutually assured destruction and perhaps the end of civilisation? Would the Vietnam War have escalated and lasted as long as it did? What would have become of the space race and NASA funding if Kennedy had seen his ‘we choose to go to the moon’ vision fulfilled? Would his many health conditions, namely his Addison’s disease and crippling back injury have come to light in public and prevented him from re-election or even caused an early death? Would his numerous affairs have become public knowledge? Would this have caused Jacqueline to divorce him while acting as First Lady? How would any of these have changed the image of one of the most iconic and beloved Presidents of all time? Perhaps Kennedy’s assassination created a hero worship that wasn’t justified? I’m currently reading the book ‘The Untold History of the United States of America‘ by Oliver Stone and Peter Kuznick. It’s really fascinating reading. Sure, Stone’s movies (including 1991’s ‘JFK’) are controversial and known for their lack of accuracy. But this book appears to be properly sourced and referenced and has the added weight of being co-authored by Kuznick an associate professor of history. It does have its critics though. It feels like I’ve been reading it for months and I’m not even into the 1950’s yet, its a bloody door stop at nearly 1000 pages but is very thorough. One of the jaw droppers so far was the coup to dump WWII Vice President Henry Wallace from the democratic party nomination by instigating a fire code breach at the venue before the vote was to take place. In the time that bought, support was gathered overnight to select Harry Truman for the role. When Roosevelt died less than 3 months later, it thrust an inexperienced amateur into one of the most pivotal roles in history. Truman was ill informed because Roosevelt had left him in the dark about everything, including the Manhattan Project. He was also aggressive and took hard stances against Russia in negotiations. Wallace was a visionary and had extensive experience and an interest in foreign policy and civil rights. If he had won VP nomination and gone on to become president would any of the following have happened? Would World War II have come to an end earlier? Would the decision to drop atomic bombs on Hiroshima and Nagasaki have been made? Would World War II have come to a more diplomatic end with the Russians and avoided the Cold War? and the subsequent spread of communism and wars in Korea and Vietnam? The what-if questions are endless! I guess we will never know.